Founded in Singapore by Joseph Lor (below, left) and Ryan Choy, Faire Leather Co. crafts well-priced leather goods and accessories for the cosmopolitan man. It currently offers wallets, cardholders and passport sleeves in its online store but recently launched a Kickstarter campaign for its two newest products – a travel briefcase and one of the best leather folios we’ve tried, what Joseph and Ryan call the Everyday Padfolio. We’ve tried, carried and worn down many, many folios in our careers. Many of them are decent in their own right but always had a few shortcomings – expensive; disorganised; flimsy; etc. Joseph and Ryan apparently felt the same way, which is how Faire Leather Co. came about. “Our products are all about effortless organisation. We’ve considered all your everyday needs. From your laptop and tablet to smaller items, everything is kept neatly and easy to access,” explained chief brand officer, Ryan. In this regard, the Everyday Padfolio (above) is a revelation. There are pockets, tags, holes and sleeves for almost your everyday items. 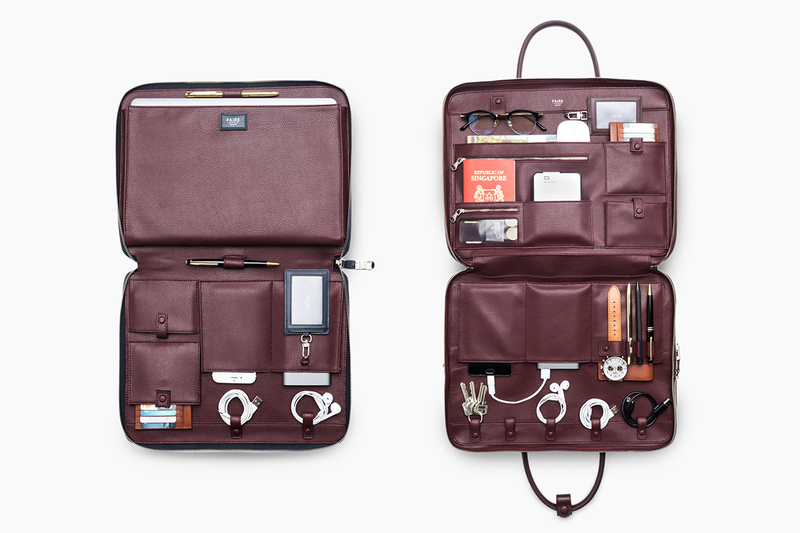 From small accoutrements such as keys and pens to larger products like your notebook and iPad, there is a dedicated compartment made for them. Fishing them out from your Padfolio is also a breeze. And yet, in spite of the sheer amount of things you can store in the folio, it doesn’t have unsightly bulges when you zip it close or weigh unevenly on one side or the other. Who doesn’t appreciate smart design that still looks this good? According to Joseph and Ryan, the entire design process spanned several months and involved countless focus groups. “We took an ‘inside-out’ design approach because that’s where the idea came from – making a bag that could neatly fit all our daily essentials. The interiors were designed by first creating a list of features we believed most people would like to have in their product. We then held focus groups to give us a better idea of what our target market thought of these features and slowly tweaked the details with each iteration. The exteriors and general structure of our products are based on classic silhouettes. We wanted to keep them sleek and minimalist on the outside, so instead of the traditional ‘front-and-centre stamped’ representation of a logo, you can only see Faire Leather Co.’s logo etched onto the surfaces of some of our custom hardware,” CEO Joseph shared. We attempt to keep hyperbole to a minimum here at AUGUSTMAN but after having tested it out, we strongly recommend the Everyday Padfolio. ‘Affordable luxury’ is a phrase that’s always thrown about when it comes to products like this, and has begun to sound trite and unappealing but Faire Leather Co. might probably deserve the overused moniker. “Luxury isn’t something that you aggressively show or display. Whether it’s solving a problem, or simply a product you like, it points to a state of comfort that becomes part of your life and that’s what luxury should be – realising great design that’s suitable for your life. That’s a luxury that most people perhaps can afford, but not necessarily find,” shared Ryan. The fact that Faire Leather Co. managed to hit its goal of $50,000 within 48 hours and is now sitting above $100,000 in less than a month demonstrates that the people are responding to Joseph and Ryan’s vision. Faire Leather Co.’s Everyday Padfolio starts at S$229 and can be reserved at its Kickstarter page here.